Lebohang Masango is a poet, author, feminist activist and a masters candidate in social anthropology. 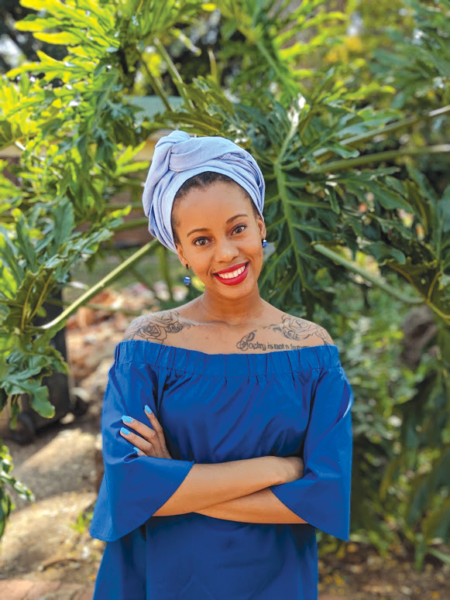 In 2017 she published her first children’s book, Mpumi’s Magic Beads, and followed that up with The Great Cake Contest in 2018. She recently submitted her masters dissertation and hopes to begin a PhD soon. You’ve previously mostly published poetry and features for various publications. What encouraged you to begin writing fiction? I began writing fiction at a time in my life when I was feeling very overwhelmed with my master’s submission. It came out of a need to do something different with my brain because at the time, poetry was not bringing me joy anymore and neither was my thesis. So I went in search of that joy through writing for children. Which is difficult but I enjoyed the challenge. Why have you chosen to write children’s fiction rather than adult literature? I really wanted to create and experience joy. When you’re writing poetry or dissertations you’re very much in the adult world and I remember feeling incredibly frustrated with all of it and like I would rather do something new and interesting with my gifts. And it’s been challenging but so much fun. You are a master’s candidate in Social Anthropology; how has this influenced your work as a children’s author? Some of my socio-political beliefs are in Mpumi’s Magic Beads. This book is derived from my honours research on primary school policies on hair and the effect it has on schoolgirls. Being an anthropologist, I care deeply about the world and even though I enjoy anthropology, I understand that work has limits to how well it can reach people as academia has been accused of being exclusionary. As an anthropologist with creative gifts I long ago decided to use my words and body to create things that are accessible to all people. I’m compelled to ensure that my work does not stay in the ivory tower of academia. Both of your books have featured black and brown children as the protagonists of the story. Why is that? I doubt authors who feature white characters get asked this question. I’m aware my work is highly political. It’s important to constantly create stories with all black and brown characters until one day this question doesn’t get asked. All of the work that celebrates and affirms black people exists in this canon that is challenging global white-supremacist capitalist patriarchy and the different hierarchies that it has created around beauty and desirability that affect all of us. And through featuring black characters in my work, I want to add to the normalisation of blackness and its representation. What impact do you Mpumi has already had? I wanted to produce a text that children love. There have been parents who have sent me pictures of their children with Mpumi’s hairstyle. One thing I’m particularly proud of is that a mother and I managed to change the school code of conduct to allow for braided hairstyles with beads for black girls at her four year old daughter’s school. I’m incredibly proud that my book had a hand in challenging these school policies. You also regularly host readings at local libraries and bookshops where you spend the day reading your stories to children. Why is this so important to do? We have very disheartening statistics on children’s literacy rates. Some parents aren’t committed to making readers of their children. That’s why the work of championing literacy is important to me and showing children that to express yourself you have to be able to read and write too. What are some of the challenges you’ve faced in getting published as a first time author? I love to have full control of my work and so I chose to self-publish. I used my savings to create my own publishing imprint called Thank You Books. But I’ve since chosen to get a publisher since I’m not particularly interested in the business side of things. They’ve been incredibly good in getting Mpumi’s Magic Beads translated into nine indigenous South African languages, which I’m very proud of. What other projects are you hoping to put out in the near future? I’d like to put out another children’s book. I’d like to create a series of Mpumi books so it will most likely be a sequel to Mpumi. I want to continue to create work that affirms and maybe even inspires.